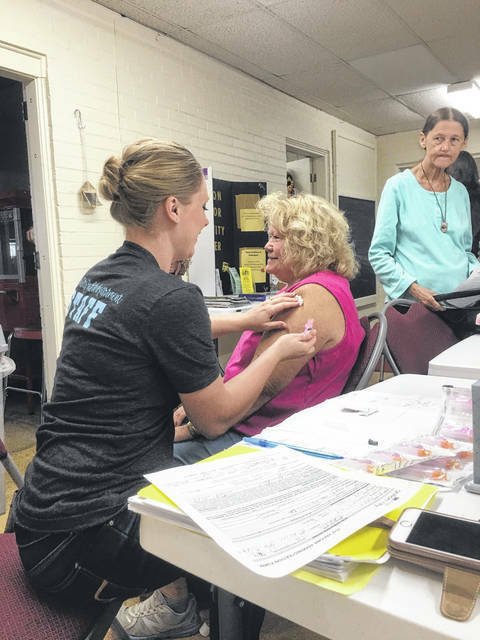 Erin Miller | Galion Inquirer - Nurse Emily Miller administers a flu shot to resident Sandra Rinehart at a walk in clinic held on Monday at the Galion Golden Age Center. According to Miller, they had seen administered approximately 50shots by midday Monday. Rinehart said that getting her flu shot was a yearly occurrence for her as a part of regular health maintenance. Three more flu shot clinics are scheduled this month. Nurse Emily Miller administers a flu shot to resident Sandra Rinehart at a walk in clinic held on Monday at the Galion Golden Age Center. According to Miller, they had seen administered approximately fifty shots by midday Monday. Rinehart said that getting her flu shot was a yearly occurrence for her as a part of regular health maintenance. GALION — Ohio flu season has started. To that end, the Galion City Health Department has scheduled several walk-in flu clinics this month. The first was Monday at the Galion Golden Age Center. There are three more this month. The Galion City Health Department has scheduled walk-in flu clinics Thursday, Oct. 11 from 9 a.m. to 3 p.m. at the Galion Golden Age Center,301 S. Market St, Galion (rear entrance); on Thursday Oct. 18 from 3- 6 p.m.; at the Grace Point Church (Activity Center), 683 Portland Way North; and Thursday. Oct. 25 from 3-6 at the Grace Point Church (Activity Center), 683 Portland Way North. Influenza is a contagious disease that spreads around the United States every year, usually between October and May. Flu is caused by influenza viruses, and is spread mainly by coughing, sneezing, and close contact. Anyone can get the flu. Flu strikes suddenly and can last several days. Symptoms vary by age, but can include: fever/chills, sore throat, muscle aches, fatigue, cough, headache and runny or stuffy nose. Flu is more dangerous for some people. Infants and young children, people 65 years of age and older, pregnant women, and people with certain health conditions or a weakened immune system are at greatest risk. The health department, 113 Harding Way East, also has set aside times for community members to schedule immunizations. They are Wednesday Oct. 10, Wednesday Oct. 17, and Wednesday, Oct 24. Call to schedule your appointment and have all insurance in formation ready. Medicaid and many private insurance cards will be accepted and must be provided by the time of service. Those with multiple insurance carriers must bring all cards. No VFC eligible child will be denied immunizations due to the inability to pay. Lastly, the Galion Board of Health will meet at 5 p.m. Tuesday, Oct. 9 at the Health Department office, 113 Harding Way East. https://www.galioninquirer.com/wp-content/uploads/sites/38/2018/10/web1_42904344_238971843437831_4808795394924347392_n.jpgNurse Emily Miller administers a flu shot to resident Sandra Rinehart at a walk in clinic held on Monday at the Galion Golden Age Center. According to Miller, they had seen administered approximately fifty shots by midday Monday. Rinehart said that getting her flu shot was a yearly occurrence for her as a part of regular health maintenance. Nurse Emily Miller administers a flu shot to resident Sandra Rinehart at a walk in clinic held on Monday at the Galion Golden Age Center. According to Miller, they had seen administered approximately 50shots by midday Monday. Rinehart said that getting her flu shot was a yearly occurrence for her as a part of regular health maintenance. Three more flu shot clinics are scheduled this month.